Windows Easy Transfer! This is a useful and simple tool that you can use to migrate Windows 2000, XP, or Vista computer to new computer running Windows Vista. Now you might ask where to get this tool? This tool is already built into Windows Vista, so you don’t have to worry. You can just go to Start->All Programs->Accessories->System Tools->Windows Easy Transfer and run this program. As for other Microsoft Windows users, you can download this useful tool here! Here is simple explanation on how it works, just ensure this tool is installed on both old and new computers, launch this transfer program and use one of following methods to connect both computers, follow the program instruction to select the data you want to transfer and then it will do the job for you. Ethernet Home Network or Wireless Network – I found out this is the easiest way to transfer data, just connect both computers to the network and then use this transfer program to do the data transfer job for you. You can take a look on this Ethernet home network or wireless network setup tutorial in case you need it. It will also work if you connect both computers directly by using crossover cable. Easy Transfer cable – if your computers are not connected to network, you can get this special USB cable and connect it to computer’s USB port and start your data transfer. To ensure the cable works on Windows Vista, check for "Certified for Windows Vista" or "Works with Windows Vista" logo on the packaging. Removable media (such as a USB flash drive or external hard disk) – Yep! Just follow the program instruction and then store the data on the USB flash drive or external hard disk, after that connect it on new computer and transfer the data. CD or DVD – If you do not have any network connection or removal media as I specified above, then you can burn the data into CD or DVD on old computer and transfer the data to new computer later. 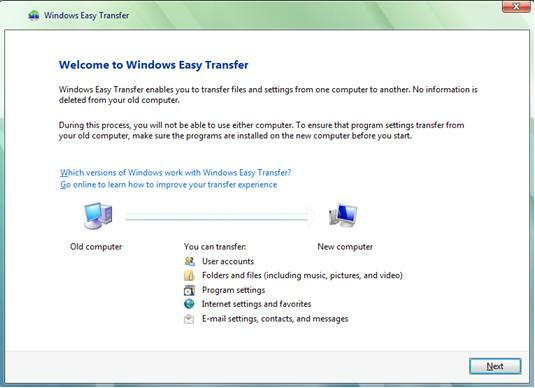 If you want to know the detailed ways on how it works, take a look on this Windows Easy Transfer to help you!